I never understood why anyone would come up with the stage name of “U.S. Bonds”. After researching as to why Gary Anderson came up with the name, I still don’t get it. Allegedly, the belief was that radio programmers would erroneously think that they were playing a public service announcement for actual U.S. Bonds and thus his releases would get more airplay. Somehow I doubt even the fine people at WKRP would have been fooled by that and if the total amount of extra rotations it got because of the “confusion” reached double digits I would be surprised. It did however make people think that “U.S. Bonds” was an actual band, and by his second album he was officially Gary U.S. Bonds. 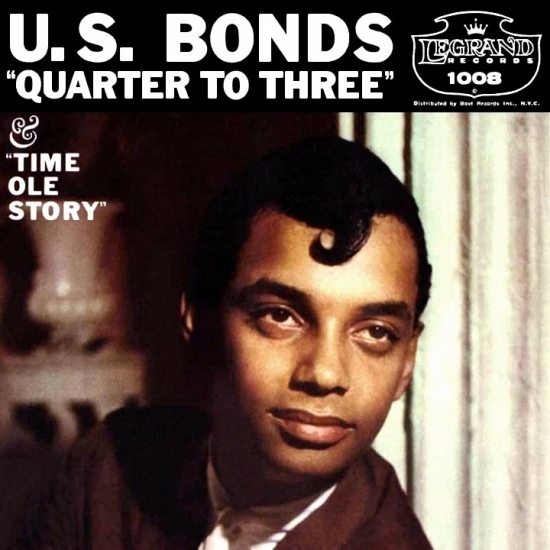 The idiotic name aside, Bonds would put out some great danceable rock music full of passionate soul, and “Quarter to Three” is a reflection of what he was capable of. Production on his records were deliberately rough to give it more of a party atmosphere and one that did not subscribed to the more polished songs of the era. Bonds would generate four more Top 10 hits (though never again to number one) in the early 60’s but he wouldn’t survive the mid-60’s and was almost forgotten had it not been for Bruce Springsteen and the E-Street Band, longtime fans of Gary U.S. Bonds who not only would play his old songs, they would befriend him and collaborate with him on new music in the early 80’s, which gave Bonds his first return to the Top 20 in twenty years and a new audience. Still, an open message to Bruce Springsteen who is so engrained with the Rock and Roll Hall of Fame that if he were to somehow bottle one of his farts that the Hall would probably put it on display with three security guards, that he should not use his influence to get Gary “U.S.” Bonds, into the Rock and Roll Hall of Fame. Sorry Gary but there are enough borderline cases housed in Cleveland already. I feel the need to go on record here, as I am a massive Springsteen fan, so apologies if it came across that I am not. Also I not so subconsciously wanted to crowbar Springsteen into this series as he is one person who never hit the top so it is worth taking the time to mention him as it won’t come across nearly as much as you think. Other Notable Songs that charted but did not go to number one in this time period: June 26, 1961 – July 9, 1961. 6/26/61: I Don’t Mind by James Brown went to #47 and to #4 on the R&B Chart. Yes Percy Sledge, I am talking about you. I am serious. Bruce Springsteen never went to #1.